DURAthin veneers are very thin porcelain pieces that are custom-made to adhere directly to the front of teeth without grinding or shaving! This means that for some people, we can transform their smile without even drilling on their natural teeth. The new DURAthin veneers, developed by Dr. Dennis Wells and dental lab technician Mark Willes, are changing the way many dentists are approaching cosmetic dentistry. 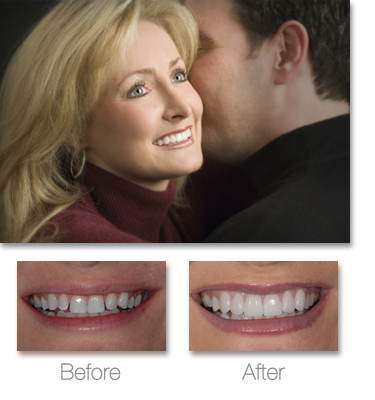 This revolutionary approach eliminates some of the concerns you may have about removing healthy tooth structure. The contact lens-like veneers are bonded directly to the tooth in instances where we are trying to increase the size of the teeth or enhance a narrow arch width. Generally speaking, people who have narrow smiles or have had teeth extracted for orthodontic reasons in the past can be great candidates for this exciting procedure. We have also used this technology to "turn back the clock" for people with small or worn teeth, giving them a more youthful smile. To find out if you are a good candidate for DURAthin veneers, call a certified DURAthin dentist to schedule a thorough diagnostic visit.